Lina Vaughn Carlisle Kill, 88, died Sunday, January 20, at her residence in Carthage. Born October 7, 1930, in Hancock County, Lina Joyce Vaughn was the daughter of Floyd and Kathryn (Mendenhall) Vaughn. She grew up in the Burnside area and graduated from Carthage High School. She worked as a secretary in the state’s attorney’s office for several years. Lina married Stewart Carlisle September 21, 1952. He preceded her in death in 1986. They farmed in Rock Creek Township for his whole life, and she continued her interest and involvement with the farming operation until her death. 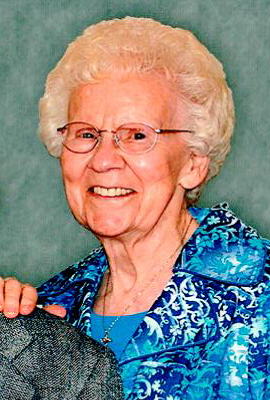 In addition to her family farm work and homemaking, Lina was an active volunteer, including work for the Carthage Methodist Church, her children’s and grandchildren’s schools, precinct election judge, Adrian Home Extension, county and state Porkettes and Illinois Pork Council. Lina was an avid reader and worked part-time at both the Little Professor Bookshop and the Carthage Library. She enjoyed travel, whether it was camping with her family or traveling overseas, and she and Stewart often hosted international guests. Known for her pies and her pickles, Lina was a great cook and especially enjoyed baking. She was also an avid gardener and birder. Stewart and Lina had three children, who survive: a daughter, Rebecca (Ken) Carlisle Doyle, rural Gillespie IL, and two sons, Daniel (Janet) Carlisle and Michael (Toni) Carlisle, both of rural Carthage. Grandchildren: Eric Doyle and Benjamin Doyle (partner Melissa Kruse); Joe (Heidi) Carlisle, Mark (Jennifer) Carlisle, Tyler (Megan) Carlisle, Mary (Alan) Byers and Jack (Lauren) Carlisle; and Dustin, Kale, Aubrie and Sydney Carlisle. Eight great-grandchildren. Lina married Charles C. Kill on April 4, 1992. He preceded her in death February 19, 2016. Her three step-children survive: Julia (Herb) Batson, Rev. Joye (Roger) Perry and Alan (Susan) Kill. There are also seven step-grandchildren: Christa (Barry) Sutherland, Nathan (Heather) Batson, Samuel and Levi Perry, and Lindsay, Lucas and Sydney Kill. Three step-great-grandchildren. She is also survived by sister in law Sherry Vaughn, sister in law Martha Van Horn and brother in law Dale Kill. Lina was preceded in death by her parents, her sister Mildred Hodgins and two brothers, Marvin Vaughn and Dale Vaughn, plus her husband Stewart’s brother, Richard (Rene) Carlisle and his sisters Alice (David) LeGrand and Lilah Ruth (Edward) Radel. Funeral services will be held at 10:00 A.M. Friday morning, January 25, 2019, at the First United Methodist Church in Carthage with burial to follow in Moss Ridge Cemetery in Carthage. Family will meet friends from 3:00 – 7:00 P.M. Thursday evening at Printy Funeral Home in Carthage. Memorials may be made to Carthage United Methodist Church and Carthage Library.